Everyone loves ribs. By slow cooking these, most of the work is done by the oven. Just sauce it, go to work, re-sauce, and then serve. Slow cooking in the oven makes the ribs fall right off the bone. Labor Intensity: could do alone. There are 2 ways to cook these ribs. One way is to slow roast it for 10 hrs and the other way is to boil them. If you have the time and oven space, I would prefer slow roasting. 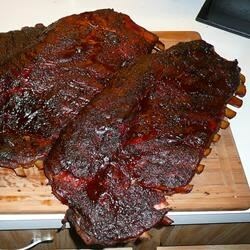 Place 2 sides of ribs on an aluminum tray in a tent formation. You could add brown sugar and gotchujang/tabasco to sauce to taste. Take out ribs after work (5:30pm) and brush on more sauce. Turn oven to 400F. Cook in oven for 30 minutes and brush on more sauce. By roasting it at 190-200F, you keep it under boiling temperature, preventing it from drying out. The temperature also allow the tough meat to become very tender when cooked for longer than 5 hrs. I like to add some water to the pan. I adapted this from a southern cooking style called "beer can chicken." The basic idea is that the top of the ribs will dry and form a nice crispy skin. The water underneath will evaporate and rise. The meat is arranged slanted and will trap the steam and absorb moisture. It will be crispy on the outside and moist inside from the steam. You can take a brush and baste the meat with the juice, like you would a thanksgiving turkey, adding extra flavor. I used the quicker recipe, and the ribs were a hit! This recipe was really easy. Thanks. the slow cook version was great! but i recommend salt lick bbq sauce, of 3 sauces tried. Thanks Tom. I'm going to try this at my next lifegroup dinner!